Off with the shoes and on with the simple summer pleasure of fresh fruit. This gorgeous dessert tastes like a mini berry pie, complete with creamy COOL WHIP. Mix graham crumbs, 1/4 cup sugar and butter; press onto bottom of 13x9-inch dish. Beat cream cheese and remaining sugar in medium bowl with mixer until blended. Whisk in COOL WHIP; spread over crust. 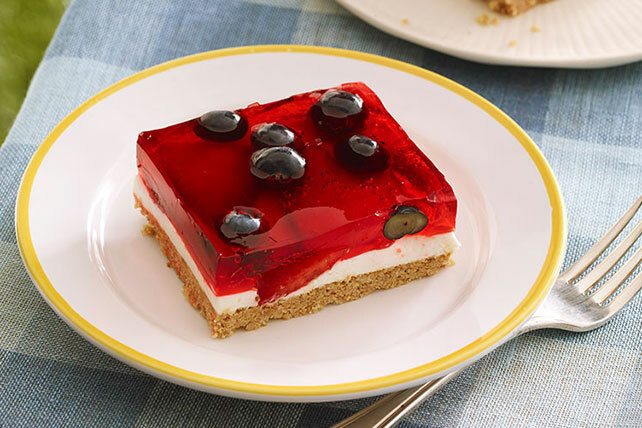 Top with berries. Add boiling water to gelatin mix in large bowl; stir 2 min. until completely dissolved. Add ice; stir until melted. Pour over berries. Refrigerate 4 hours or until firm. Place completely unwrapped packages of cream cheese in microwaveable bowl. Microwave on HIGH 20 sec. or just until softened. Prepare using 2 pkg. (3 oz. each) JELL-O Strawberry Flavor Gelatin.